Primary School children were given the opportunity to be at one with nature at a fun and interactive day at Our Orchard, a unique space being developed at University Hospital Llandough (UHL). Our Orchard at UHL welcomed 30 children from Lansdowne Primary School to fill the new bug hotel, undertake bird watching and learn how to do willow weaving, while finding out some fun facts about the land. The children were met by Our Orchard ambassador Dr Rhys Jones who entertained the children and brought nature to life for them teaching them about the importance of the environment and the benefits Our Orchard will bring to the local community. Simone Joslyn, Engagement Lead for Our Orchard said; “This has been a great opportunity for the Health Board to engage with young people in its plans for the future of Our Orchard project. It was also an opportunity to introduce them to a hospital which can often be a frightening place for children, in an exciting and creative way. Hopefully this will alleviate some concerns if they ever need to attend University Hospital Llandough or other hospitals in the future. 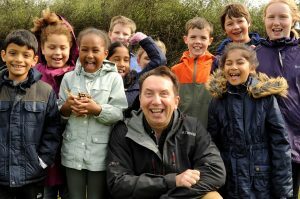 “I want to say a big thank you to Dr Rhys Jones for his time, the RSPB staff and volunteers who undertook bird watching with the children, Out to Learn who taught them willow weaving and Men’s Shed who built our incredible bug hotel, which will give a safe space for bugs to live during the development. As well as learning about the new outdoor space, the children also got the opportunity to visit the Hearth Gallery, the first hospital art gallery in Wales and listen to the UHL choir, where they even got to test their vocals and join in with the Lion King’s Circle of Life. Our Orchard is a unique space at UHL which will become a legacy for generations to come. This long term project will be established in phases and will include a semi-natural planted area which has been set aside for the protection of plants and wildlife, wildflower meadows and a bee sanctuary. Our Orchard will be created on seven acres of semi-rural pasture land and woodland which makes up part of the UHL estate. This will benefit patients, staff, visitors and the wider community and will be funded entirely through donations made to the Cardiff & Vale Health Charity. No NHS funding will contribute to the development and maintenance of this unique outdoor space.